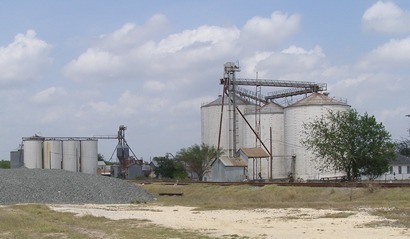 Annie T. Hamilton paid the San Antonio, Uvalde and Gulf Railroad to build a depot on her land in 1913. Her money bought her the immortality of having the town named Hamiltonburg. Her immortality was short-lived, however, when mail was frequently sent in error to Hamilton, Texas. The mail-receiving residents of Hamiltonburg wanted a new name - and fast. 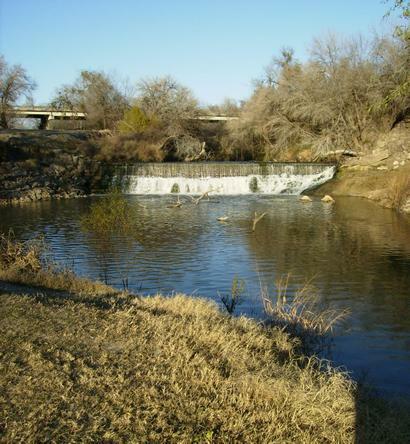 Charles R. Tips who had sold parcels of land for the townsite, suggested the town be named for its location near the three Rivers of Atascosa, Frio, and Nueces. The new name was in effect on May 1, 1914 and we have been unable to find a record of Annie Hamilton's reaction. In 1920 natural gas was discovered, piped into town and soon a refinery and a glass factory were built. 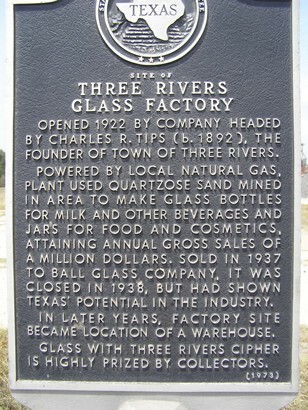 The glass factory was closed in 1938 but the refinery today now belongs to Valero (formerly Diamond Shamrock) and is the town's major employer. In 1925 the population was estimated at 1,000 and it slowly increased by 1965 to 1,932 and later to 2,177 by 1988. 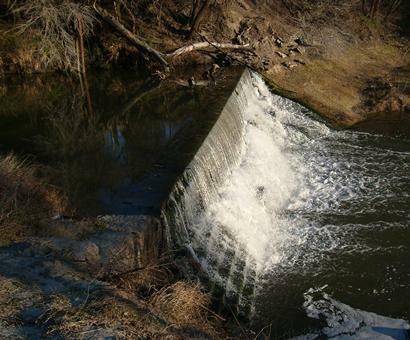 The building of a dam produced Choke Canyon Lake. The town has been flooded at least once. 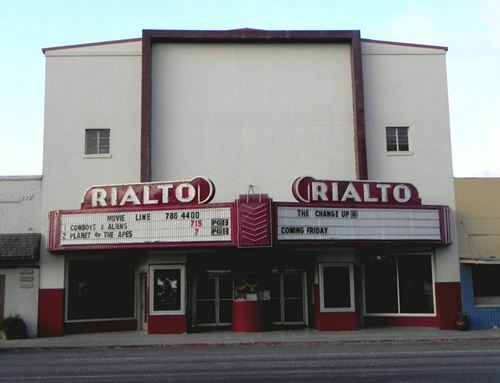 and only recently (2003) has the theater downtown reopened after being totally restored. Only recently (2003) has the theater downtown reopened after being totally restored. 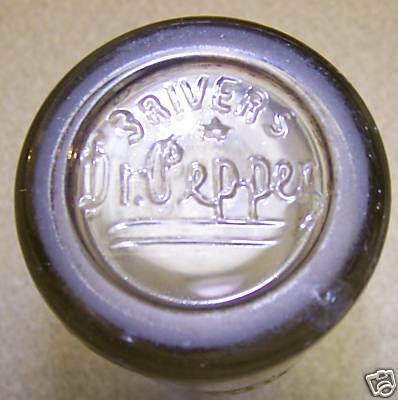 "A new twist on spiral columns at the gas station"
Bottom of Dr Pepper bottle made at the Three Rivers Glass plant. Founded March 1913 by Charles R. Tips. An investor chartered June 12, 1913, as Hamiltonburg--named for local family. Town lot sale began July 4, 1913. 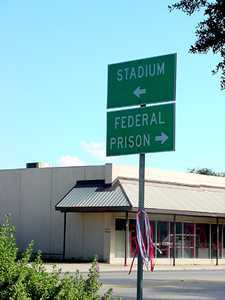 Townsite renamed by U.S. 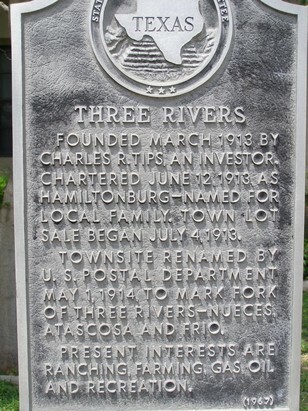 Postal Department May 1, 1914, to mark fork of three rivers--Nueces, Atascosa and Frio. Present interests are ranching, farming, gas, oil and recreation. Camping, fishing, boating, swimming, picnicking, hiking. 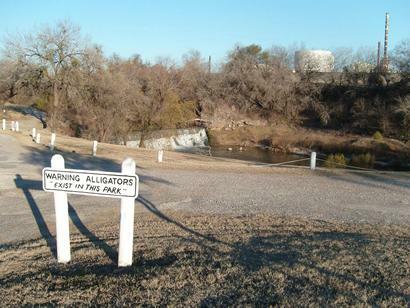 Tips Park - On Frio River. 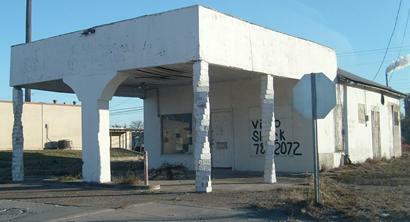 One mile west off Hwy 72.